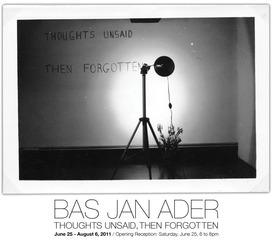 Patrick Painter, Inc is pleased to present a selection of works by Bas Jan Ader in the East and West Galleries, from June 25th to August 6th 2011. The show will feature photographs and silver gelatin prints in our West Gallery, and the major installation Thoughts unsaid, then forgotten in our East Gallery. Dutch born and California-based artist Bas Jan Ader (1942-1975) mysteriously vanished in 1975 when he set sail on what was to be the smallest sailboat ever to journey across the Atlantic during the execution of the third part of his work on the project In Search of the Miraculous. Now in 2011, more than 30 years after his disappearance at sea, he is more influential than ever before. Ader left behind a body of work that borders a fine line between humor and dismay. The seven works being displayed in our West Gallery share this underlying theme and explore the complex dynamic between personal expression and the traditional role of the "artist". Ader uses his own body as both the object and subject of his works to carry out the emotive actions he documented. In the photographs and prints included in the exhibition, Ader captures elements of both anticipation and resolution. The installation, Thoughts unsaid, then forgotten, first practiced by the students of the Mezzanine Art Gallery at the Nova Scotia College of Art and Design in 1973, will be on view in our East Gallery space. The work is comprised of a lamp affixed to a tripod, flowers in a vase, and "light grey-blue" text written on a "white sparsely lit wall" which reads: "THOUGHTS UNSAID THEN FORGOTTEN". The installation emphasizes the importance of text and language as a visual medium within Conceptual Art. Ader graduated from the Otis College of Art and Design in 1965 with a BFA, and from the Claremont Graduate School in 1967. After graduating, Ader taught at many institutions, including Mount San Antonio College and the University of California, Irvine. Ader's works have been exhibited at various institutions including: Museo de Arte de Zapopan, Guadalajara, The Pitzer College Gallery, Claremont, The Camden Art Centre, London, Museum of Modern Art, New York, and Centre Georges Pompidou in Paris. In October 2011, Ader's works will be featured at the Orange County Museum of Art as part of Pacific Standard Time, a massive regional exhibition showcasing post-war art in Los Angeles.